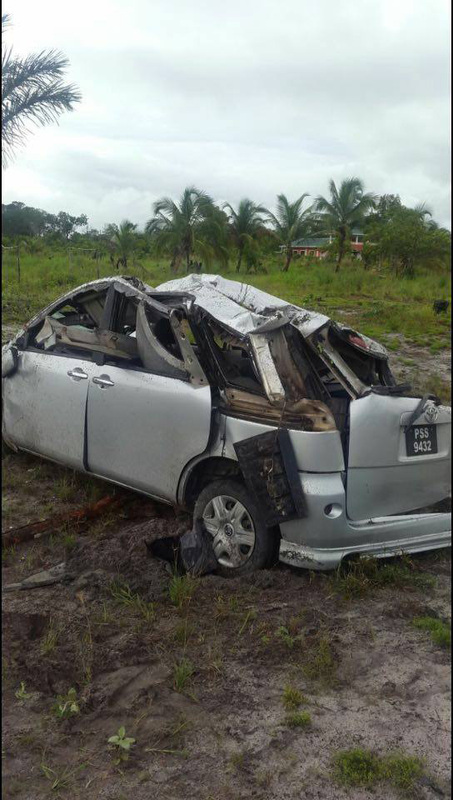 A former goalkeeper is now dead and two of his children are injured after he lost control of the car he was driving along the roadway at Bamia, Linden-Soesdyke Highway yesterday afternoon. 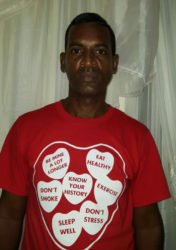 Dead is Rawle Adams, 45, a former Top 20 goalkeeper of 33 Constabulary Compound, Mackenzie, Linden. According to reports, he was thrown out of the vehicle and sustained injuries. He was taken to the Linden Hospital where he was pronounced dead on arrival. His two children, Nehemiah and Hosiah, were taken to the same hospital for medical treatment. They sustained minor injuries. The mangled car, PSS 9432, after the accident. The accident occurred around 14:15 hrs at Bamia on the Linden-Soesdyke Highway. Police, in a press release issued yesterday, said Adams was driving a motor car along the roadway, allegedly at a fast rate, when he lost control of the vehicle and crashed. According to reports, at the time of the accident, Adams, a Bosai Mineral Inc security guard, along with two of his four children was heading to Georgetown to pick up his wife, Melanie, who was celebrating her birthday yesterday. Unconfirmed reports were that Adams had swerved to avoid hitting a child who was standing on the roadway. The car, PSS 9432, was badly damaged. His brother, Deron Adams, related to this newspaper that he last heard from Rawle last week when they met up and had a conversation. He said he learned about the accident after a receiving a call from a friend. Deron said when he arrived at the scene, his brother had already been taken to the hospital. Rawle’s body is currently at the Linden Hospital mortuary awaiting a post-mortem examination. He was well-known in his community and was described as very friendly and peaceful.